Have the BEST of all worlds in a single latent print powder. Developed as a result of questions raised during training classes. 'JOLT' was designed to overcome almost all processing situations. 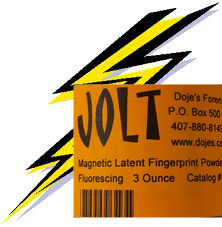 A Black, Carbonless latent print powder with super sensitivity that fluoresces several wavelengths and can be used with a magnetic applicator or brush. Give a 'JOLT' to latent fingerprints on your next crime scene.